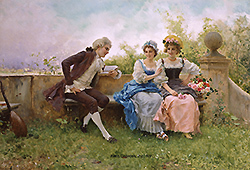 Federico Andreotti was born in Florence on March 6, 1847 and received his artistic training at the Academy in Florence. There he studied with Enrico Pollastrini (1817-1876), the President of the Academy, and Angiolo Tricca (1817-1884). His academic studies prepared him well for his chosen subject matter – historical figurative works set in the 16th and 17th centuries. The late 19th century saw a resurgence of interest in this period of elegance and many artists, including Toudouze & Moreau, in France, Marcus Stone, in England, and Madrazo, in Spain, also looked to satisfy the growing need for these works. Andreotti’s paintings were sought after by American and European collectors alike and during the late 19th century he received an important commission from the King of Italy. While little is known about his exhibition history in Florence, he did show a number of paintings at the Royal Academy in London from 1879 – 1883; including: Her First Exhibit (1879); A Happy Father of Twins (1881); A Village Maestro (1882) and From the Wrong Cask (1883). A number of his paintings were reproduced in important art reference books during the late 19th century. Below is the caption that accompanies one of them – A Shady Nook: How often it happens that the sentiments expressed in the page of some book bring two people to the realization of the existence of a bond of sympathy between them, which in time grows into love. It may be the mere trifle of a thought, but it is the spark which kindles the flame. 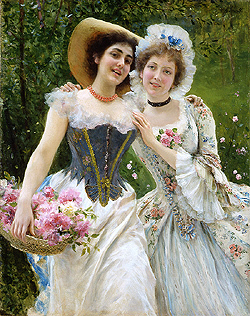 The artist must have had this in mind when he painted this “Shady Nook,” to which these lovers have found their way, under that mysterious guidance which always leads lovers to the most secluded and beautiful spots. The beautiful young girl looks down into the face of her handsome lover, reclining on the seat beside her. His eyes are speaking to her of love while his lips speak of the lines of the book he has been reading. The quiet solitude of the place, the murmur of faint breezes passing through the trees, and the fragrance of the flowers which grow wild and untrained, all contribute to inspire a certain sense of loneliness which brings them closer together. Surely this lover will not have to press his suit, for the heart which he seeks has been granted before he has asked it. Wallace, General Lew, Famous Paintings of the World, Jones Brothers Publishing Co, Cincinnati, OH, pg. 36, Ill.